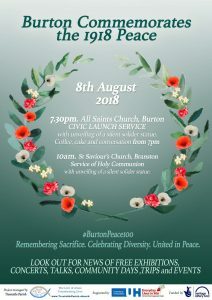 Burton Commemorates the 1918 Peace. Funded by Heritage Lottery Fund, this is an exciting project aimed at bringing together our diverse communities in remembrance of the sacrifices made throughout the First World War, at home and away, and to stand together in thankfulness with a united vision of peace for our world. The project opened on Wednesday 8th August, with a big civic service at All Saints, starting with coffee, cake and conversation from 7pm (service from 7.30pm), and also with a quiet service of holy communion and reflections at St Saviour’s church at 10am. There was an unveiling of our Silent Soldier Silhouettes at both services. 8th August marks the start of the 100 day offensive that brought a close to WW1. The project’s activity days, talks, trips, exhibitions and events will run up to and beyond the Armistice centenary on November 11th, culminating in a great peace concert in 1919. There will be something for everyone, and we hope everyone will get involved. The project is run by our parish, but is for all of our communities. Please hold the project in your prayers and support it by coming along to events, bringing your neighbours and spreading the word amongst those around you! Our thanks to the Heritage Lottery Fund, and national lottery players for making our project to commemorate the peace that followed the end of the First World War possible.